The rock wallaby is definitely an acrobat. Delicately and majestically leaping and bounding their way around cliffs and rock edges across the rugged and steep country of east coast of Australia. They are so good at climbing that they have even been seen scrambling almost vertical rocks. They are able to balance so well because of their furry tail and padded feet for grip. They don’t just stick to rocks, being known to climb tall trees with their sharp claws and strong legs. The brush-tailed rock-wallaby hangs out on the east coast of Australia. In a big range following the Great Dividing Range from southeast Queensland to Western Victoria’s Grampians. They live in rocky areas which have caves and ledges for shelter and face north for warmth. The brush-tailed rock wallabies’ most notable feature, as their name implies, is the distinctively bushy tail. They need to be agile hence they only get up to eight kilograms in weight and reach up to half a metre in height. They graze on native grasses found in surrounding habitat at dawn and dusk. They also feed on the foliage and fruits of shrubs and trees as well as roots and bark. Brush-tailed rock wallabies have small home ranges of about 15 hectares in size and their colonies are made up of a few adults and kids. 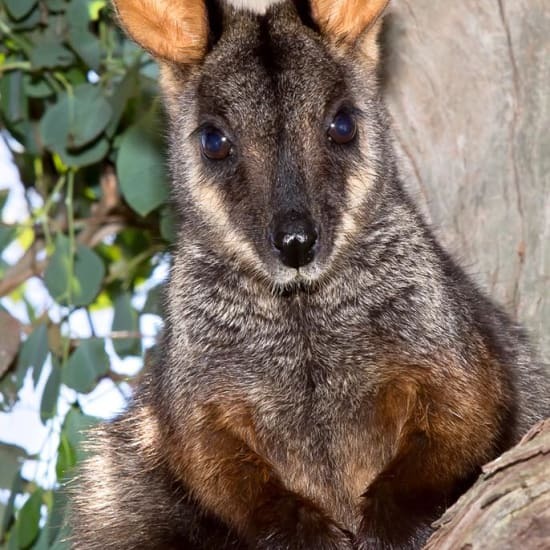 There are only around 30 wallaby’s left in Victoria. They are the ones that we are looking after and the ones that are struggling the most. The New South Wales and Queensland wallabies are doing a little bit better but not by much. Life is tough for brush-tailed rock wallabies. In the past brush-tailed rock wallabies were considered pests and were hunted for their skins, which contributed to a massive decline in numbers. They have been lost a lot of their favourite rocky homes due to us humans taking it over for housing or farming. They also have some feral animals coming in and killing them – foxes and feral dogs. Because they eat grass they have more competition with other introduced grass eaters such as feral goats, sheep and rabbits. This competition forces them to search for food outside their natural ranges. • $10,000: Genetic management of current insurance population (includes DNA processing) to ensure the population remains genetically diverse. • $50,000: 10 x GPS tracking collars, 10 x remote monitoring cameras, 30 rock wallaby traps. Brush-tailed rock wallabies are highly territorial. Monitoring population dynamics and social structures is critical in providing vital information for successful future wild releases. • $100,000: Habitat expansion within protected reserves. This potentially triples the carrying capacity for the southern brush-tailed rock-wallaby. Mount Rothwell Biodiversity are putting their hands up for this work – they have the experience and the space to make this happen. Donate directly to Conservation Volunteers.